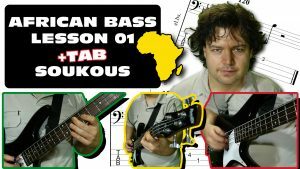 This soukous bass guitar lesson begins with a syncopating phrase, right after the two 5ths of the root note. 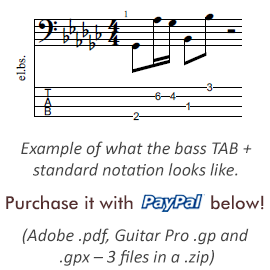 You can download the tablature at the bottom of the article. The piece is in G major, the underlying chord progression is I-V-IV-V for part one, and I-IV-V-I for the higher, sebene part (part two). Syncopation is a defining element of Sub-Saharan African music, and it will be prominent throughout this example as well. The first part of the lesson contains parts where you need to leap over one or two strings with your fretting fingers. These jumps are fifths and octaves, and they require a clean technique. Both your fretting and your picking hands help muting the adjacent strings, so you don’t get unwanted notes nor buzz. Make sure that you develop a habit of lifting your fingers above the strings just as much as necessary. If you have a distance too big above the strings, you won’t be able to play faster tempos in a relaxed manner, and your fretting stamina will suffer. Lifting too high can result in hammer-on ghost notes as well. Playing with plastic fingerpicks and a thumb pick have the advantage of being able to play in a way that each successive note have strong definition, created by the attack transient of when the pick releases the string. It also enables the player to achieve speed relatively easily, at least when it comes to shorter burst of notes. The second, sebene part of the piece demonstrates this, especially when the ring (A), middle (M) and index (I) fingers play two sixteenth notes and an eight note in quick succession. It’s worth practicing this particular sequence of the three fingers separately as well. This way, your brain will be able to “batch execute” this movement, without having to pay attention to each fingers individually. There are two more such parts in the lesson, involving two fingers. I suggest you to begin the practice with slow tempos without a metronome or click track. This way you can make sure you are able to execute even the problematic parts. When you can play all the parts individually at a slow tempo, all you need to do is put these parts together and play one after the other at the target BPM. It will be much easier to do this, if your brain has already learned even the more difficult finger movements at a slower speed.